The police department of Bellevue Nebraska fired officer Christopher D. Parent for failing to meet physical standards of fitness. As might be expected in our litigious age, he appealed the action of the police department. In a shocking decision he was reinstated by the Nebraska Court of Appeals. The Nebraska Court of Appeals, in an opinion released Tuesday, reversed the Bellevue Civil Service Commission’s decision upholding the termination of Christopher D. Parent. Parent, 52, had been a member of the Police Department for more than 25 years, mostly as a detective, but had been reassigned to road patrol. His firing stemmed from his performance during an Aug. 28 combat shooting exercise, which prompted fellow officers to report him to the command staff. Bellevue Police Lt. Mark Elbert has said Parent, whose 2005-issued Nebraska driver’s license listed him at 5-foot-9 and 300 pounds, was fired under a policy that requires officers to be physically fit. The court based its decision upon a definition of wellness which as since been tightened. It is sad that Mr. Parent has put his own desire to be a police officer above the well being of the public. 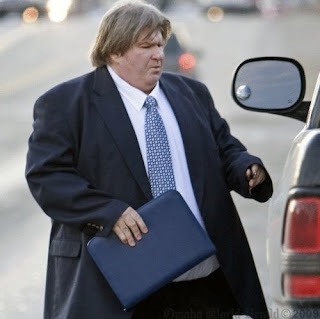 Chort or reducing his weight to Department guidelines, there is a lot of detective work that involves evaluating evidence and other non physical tasks. Unfortunately, there is a wide range of activities in the course of regular police duties that would be difficult for Detective Parent in his current condition. I hope this decision is reversed on appeal. The needs of the public do matter. 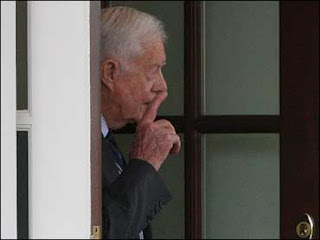 In this picture, Jimmy Carter is seen leaving the White House after meeting with Barack Obama. In the picture, his finger seems to miss the mark, as did undoubtedly his political advice. In this picture, Jimmy Carter is shown after advising Obama on cabinet picks. Heaven help us all. Jimmy Carter is back in the White House. CBS News reports as follows. 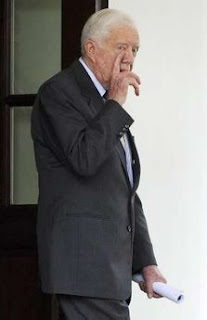 Former President Jimmy Carter was seen at the White House this morning, where he spent about 90 minutes in the West Wing - most of it with National Security Adviser Jim Jones,* reports CBS News White House correspondent Mark Knoller. Mr. Carter's press secretary said Carter received a "private briefing ... as he has had with past administrations." The White House added that President Obama briefly greeted Mr. Carter during the visit, reports Knoller. According to Reuters News, the percentage of out of wedlock births in America has grown to 40%. Reuters reports as follows. A record 39.7 percent of babies in 2007 were born to unmarried women, including 71.6 percent of black babies and 51.3 percent of Hispanic babies, the report found. The birth rate for teenage girls rose 5 percent between 2005 and 2007, according to the report. One of the most important factors in preventing delinquency and drug abuse is a two parent family in which the couple is married. It should be common sense, but parents who raise their own biological children have traits which tend to be biologically matched. This works strongly in favour of bonding in familial relationships. With all the talk of gay marriage, is anyone doing anything to promote and save traditional marriage? Personal choices to have children out of wedlock have societal repercussions. What can be done to reverse this disturbing trend?